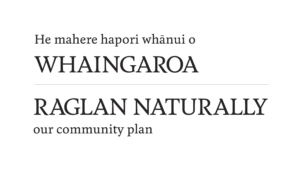 Raglan Naturally Community Plan is created. Key areas identified and project priorities for community infrastructure and facilities, created a roadmap for relationships and responsibilities between the community, the Raglan Community Board and WDC. Raglan Naturally reviewed. Briefly summarised the intent of RN and reaffirmed its relevance. Produced a comprehensive project list. Raglan Naturally Celebration! Time to revitalise our community plan. Interim Steering Group worked on foundations of the review process. Initiated new relationship with WDC. Held a community gathering at Poihakena Marae. Sourced funding. Project Coordinator appointed and endorsed by the Raglan Community Board. Relationship Building. New learnings – Treaty of Waitangi workshop. Local stories shared. Focus Groups established. RN Committee set up. It’s all about community. Getting out in the community – Creative Markets, Maui Dolphin Day, Music and Dance Festival. Project Planning. RN Newsletter and Facebook page set up. We’re getting out and about. Raglan Community Board agrees to hold responsibility of Raglan Naturally and have it added to RCB Charter. RN Committee established as a permanent sub-committee of the community board. 11 Focus Groups established and start work on creating Snapshot Reports. Approximately 60 people involved. Focus Group Workshops. Future Focus Workshop, Treaty of Waitangi Workshop and Full Day Focus Group Workshop. Youth Focus Group forms. Community Wide. Focus Groups work on Snapshots. RN Committee work on Vision and Values. Raglan Naturally – Community Wide Engagement. Te Uku, Te Mata, Raglan Town Hall. Website. Survey. Management and Implementation Plan created. Community Plan finalised. Meetings with stakeholders regarding implementation and ongoing support of RN. RN feeds into WDC Blueprints and Long Term Plan. Raglan Naturally updated and alive! RN continues to grow and evolve.